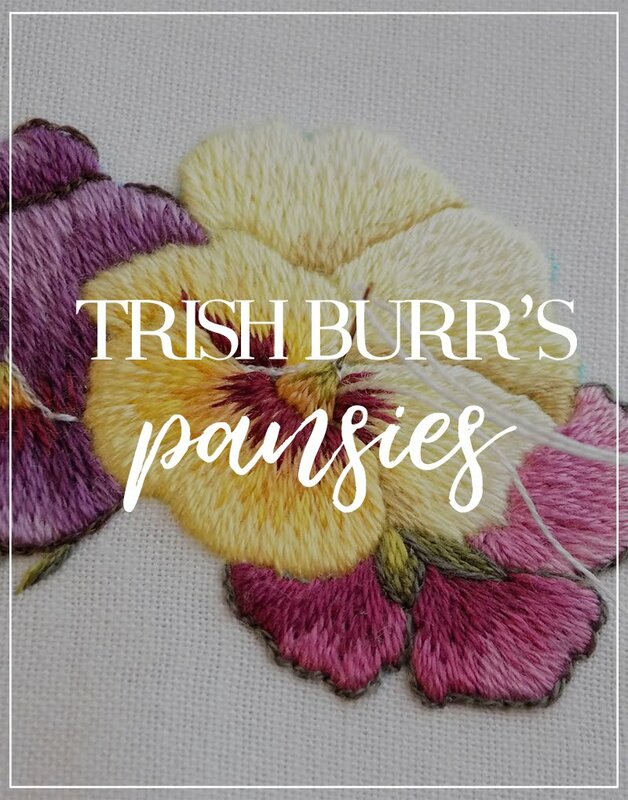 If you've been around my blog for a while you might already know that I'm not really a fan of lining in embroidery, although it is indeed needed in many situations. So, like a true lazy enthusiast, I came up with an alternative! 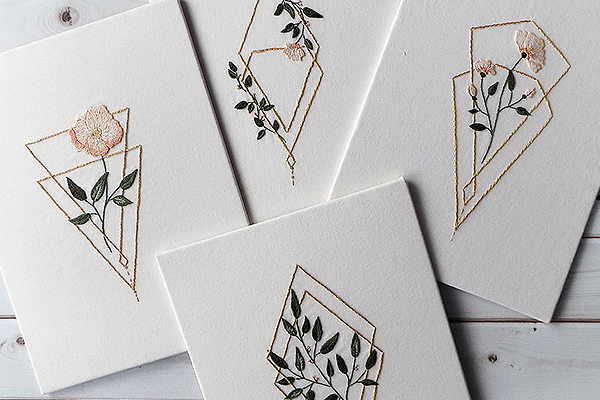 Lining in embroidery is NOT the same thing as in sewing. In embroidery, the term “lining” stands for the fabric that is attached to the ground fabric (the “face”) of your needlework. 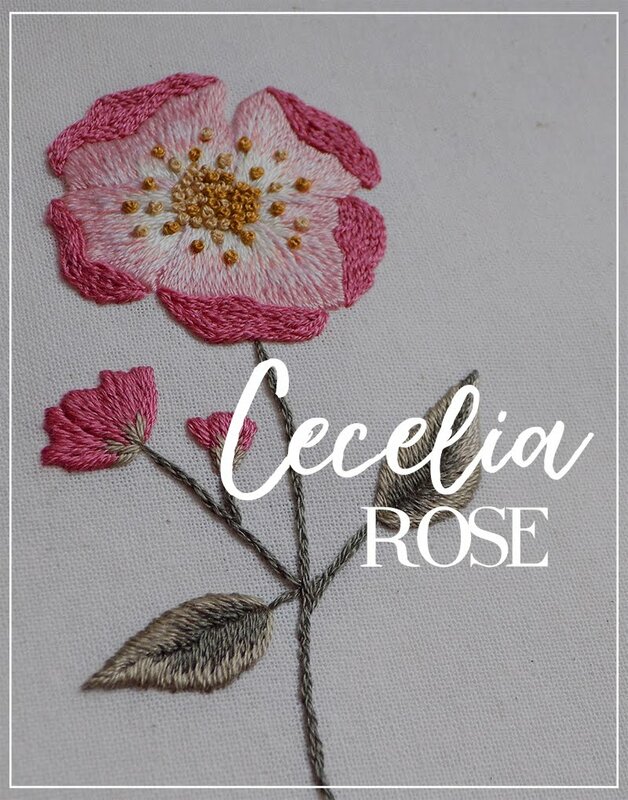 b) the ground fabric fits the project's appearance (high quality, matching color), but is not able to support the stitching: dense needlepainting, goldwork, crewel work, goldwork, applique, and stumpwork. Some fabrics can't provide enough support for the stitching (either they are too lightweight or the weaving is too loose), so they need some backing. In such cases, a stitcher can use an extra bit of fabric to support the ground one. 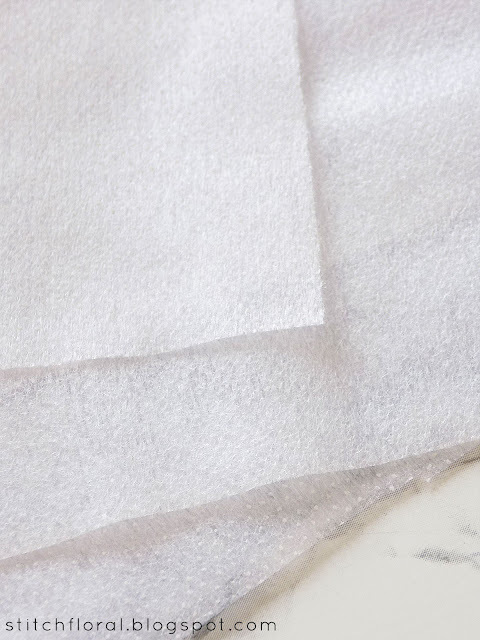 Naturally, one wouldn't want to waste a nice piece of fabric that can be used needlework, so a common solution is to settle on rather cheap and moderate cotton muslin. Firstly, you need to cut out matching pieces of fabrics: one for lining and one as the ground surface for your needlework. Secondly, you need to preshrink both of them. Preshrinking is a pain in general (for me, because I'm lazy) but preshrinking both fabrics in an equal manner adds to the pain. *Let me be honest: I like to avoid preshrinking my ground fabric. With time, I developed my own tricks on how to avoid all the puckers that can arise after washing, so preshrinking is not needed. But if I used two layers of fabric thanks to the lining, preshrinking would be a must: because after washing they could shrink differently and the needlework's appearance would be ruined. Thirdly, you need to align them by grain. 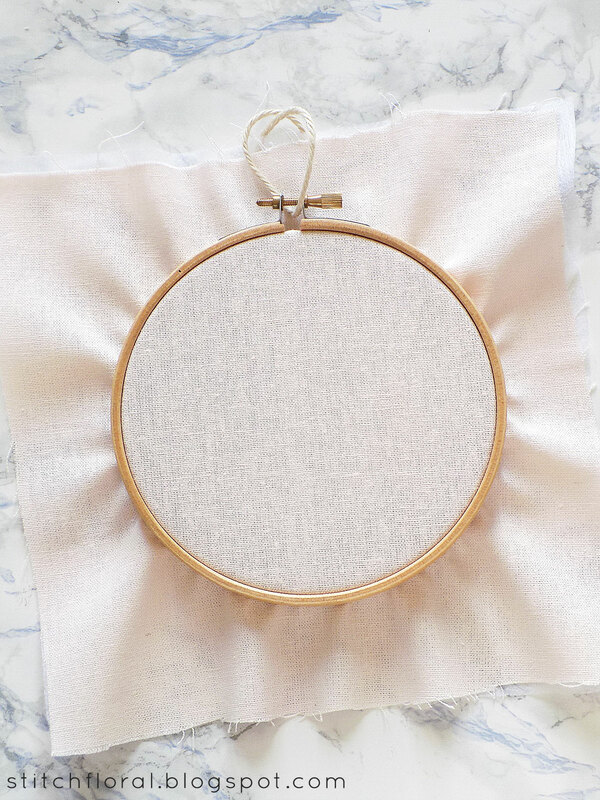 You can't have one fabric in your hoop with the lengthwise and crosswise grains being vertical and horizontal accordingly and then have your lining fabric underneath with the grain situated diagonally. No, they need to be aligned correctly. Fourthly, you need to place them both in a hoop, one on top of each other, and make sure they are both evenly taut. Which is not a simple task. Even with one fabric you can make a mistake and cause wrinkling and puckering if the fabric is not evenly stretched. What more, if there are two layers of it. And if you didn't succeed in stretching them evenly (for example, one didn't stretch enough while the other was stretched too much), then wait for bubbles, puckers, and wrinkles. You can baste the fabrics together before hooping them, of course, but it won't guarantee even tautness for the both of them. Fifthly, after placing both lining and ground fabric in the hoop, you start stitching through both of the layers. If your stitching needs more than one session, you will need to take the fabric out of the hoop and place it back for the next session. And you have to make sure that they are both stretched the same way again. I guess at this point, it is pretty clear why I find traditional lining bothersome and do my best to avoid it, haha. But the thing is, you really DO need lining in certain cases. So, is there anything you can do to get the same result as tradition lining gives, but at the same time, avoid the trouble of preshrinking two fabrics, aligning, and evenly stretching them? There is actually a solution. And a pretty easy one! 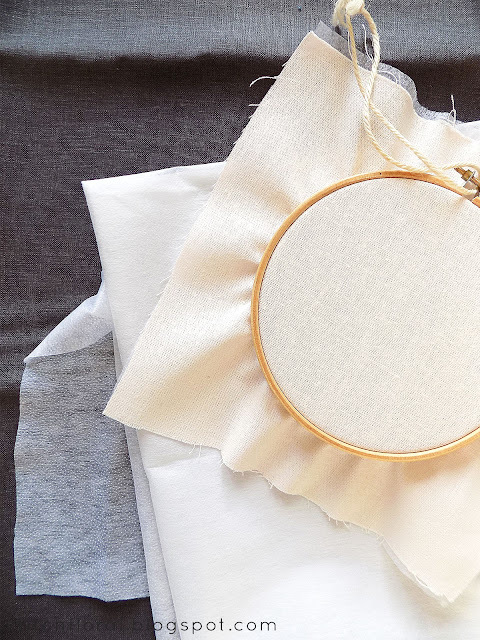 Interlining is commonly used when sewing garments. It is a special kind of fabric that is produced to help keep the garment's component in a needed shape, support it, make it sturdier. Think of collars, cuffs and fabric bags that keep the shape. There are various types of interlining. For embroidery purpose, we are interested in fusible interlining with one side of the adhesive coating. It also needs to be rather light because our purpose is NOT to create a sturdy thick material, but only to give a bit of extra support to the ground fabric. This is the interlining that I'm using. It is very light and not woven. On one side it has these tiny bubbles that hold adhesive substance inside. When you apply heat and pressure the glue spreads out. Here is an analog I found on Amazon. It is not a referral link, it is just an example I found. In fact, it is better to visit sewing supplies stores to find the right one. Place the interling on the ironing board with the coated side up and place the ground fabric on top of it with the wrong side down. There is no need to align anything. Just make sure the coated side of the interlining is facing the wrong side of your ground fabric. You will be ironing the right side of the ground fabric. Glide the iron over the whole area of the ground fabric so that every bit of fabric receives at least several seconds of heat. The catch is, we don't really need to attach the interlining perfectly. Because sturdiness is not our goal, we can allow ourselves to slack off a bit here. That's why we are ironing this “sandwich” from the ground fabric's side and not from the side of interlining so that the heat is not applied directly on the interlining. You can check how it is holding: if it is attached alright but you can still peel it off if you pull by a corner, then that's enough. 8. 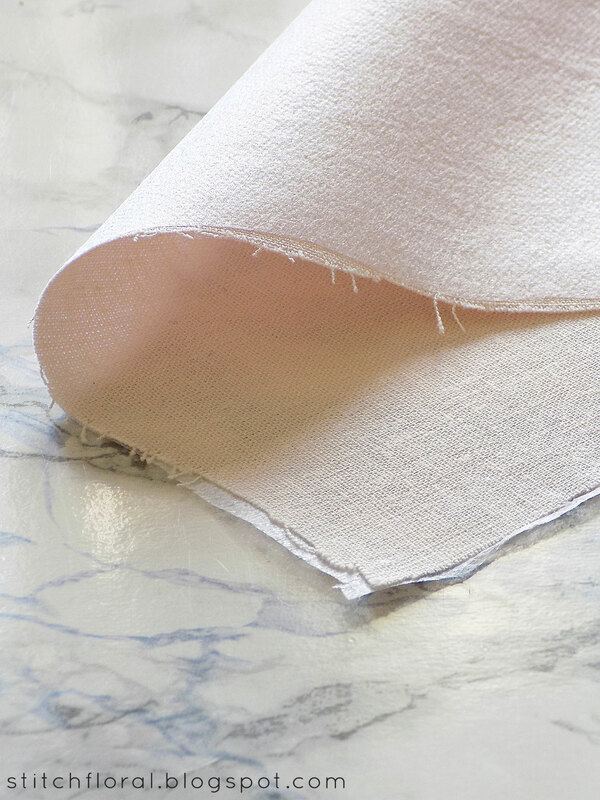 And an extra advantage: it prevents fabric from fraying. 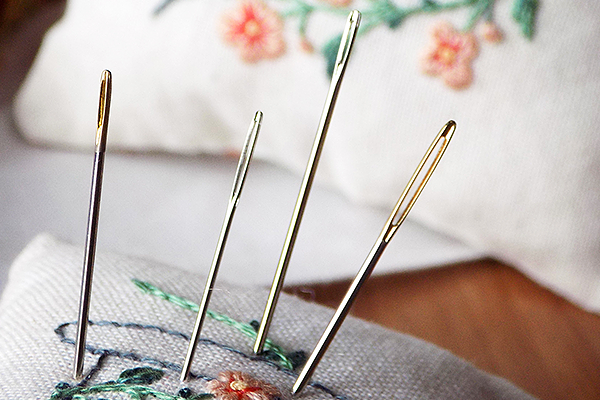 The essential feature for applique and stumpwork. 1. You can't wash your ready piece, because the interlining might fall off or will just lose its shape. If you are a fan of water-erasable markers, it's definitely a drawback for you. Or, you can peel the interlining off after finishing the needlework, trimming it around the embroidered area. Like I mentioned above, it is still possible if you don't attach it completely. The ground fabric will lose some support but if you only need to mount it now, it is fine. 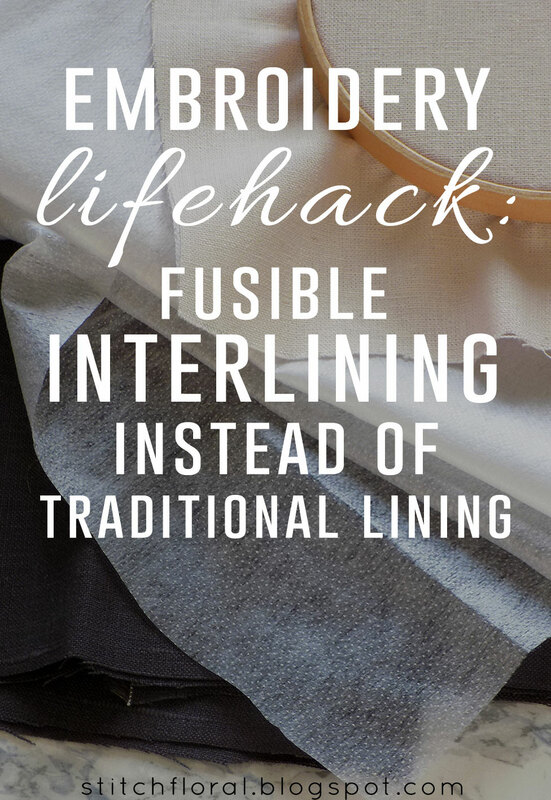 Otherwise, if you still need that support, you can just apply the interlining again after washing and drying the piece. 2. After applying interlining, ground fabric is not as flexible anymore, which might make the process of mounting more difficult. There is a solution, again, though. You can either peel the interlining off completely or trim it so that only the area on top of cardboard has interlining. Or, once again, you can trim it right around the embroidered area, like they do in machine embroidery. Remember that there are different types of interlining out there. There are some that will make your fabric resemble a cardboard and will rip like paper at creases. There are also woven types of interlining with one coated side. You can use it the same way, except that you would need to align it by grain to the ground fabric. So, like I said before, test it on a spare piece of fabric first! Special embroidery fabrics are usually too costly for me, so I prefer using nice fabrics that I can find in sewing stores. Especially linen, which often has a wide palette available with exactly the colors I like. 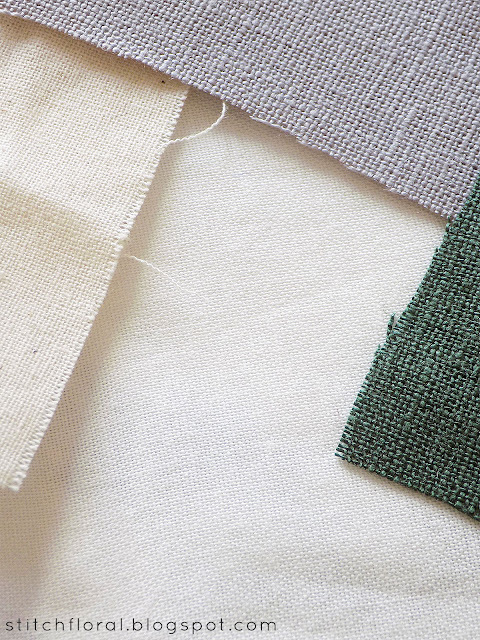 Granted, this type of linen often has some irregularities and bumps unlike the perfect surface of embroidery fabrics. But, in my case, these imperfections make them even more attractive. I appreciate the rustic feel, haha. The problem is that linen for garments is usually more light-weight and the weaving can be a bit too loose for my liking. In the picture above, on the left are my favorite cotton fabrics which I use for embroidery, and on the right, and on top are some examples of garment linen. This linen isn't sheer. 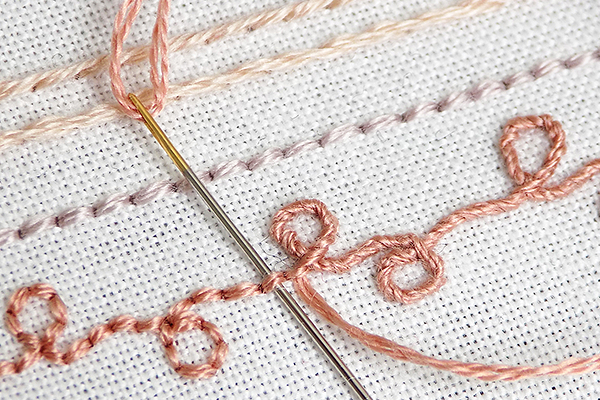 But, for dense stitching like needlepainting, it is a bit too loose-woven and sometimes can be too flowy than desired. A situation like this calls for traditional lining. But, in my case, I just go for interlining and get everything: the needed support for my project and the needed piece of mind saved from the troubles of preshrinking and such. 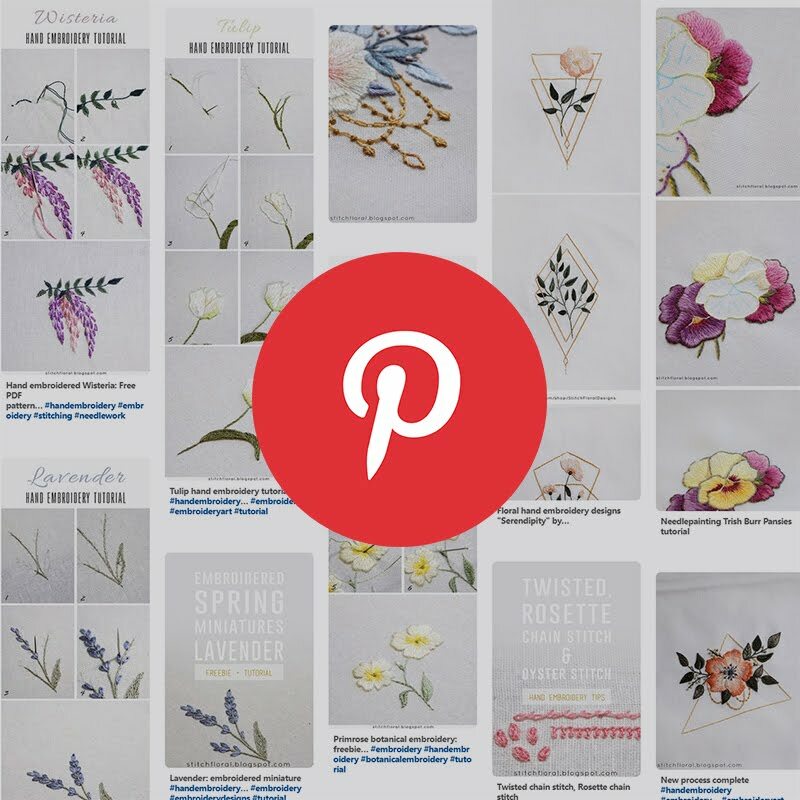 So, here is a little tip for you if you are not a fan of traditional lining in embroidery, like me :) Give it a try and maybe you will become an interlining enthusiast together with me, hehe. Hello Amina, This is an excellent post and one I will make sure to remember. I am actually laughing at myself, due to the fact that I have interfacing materials of a wide variety in my supplies. 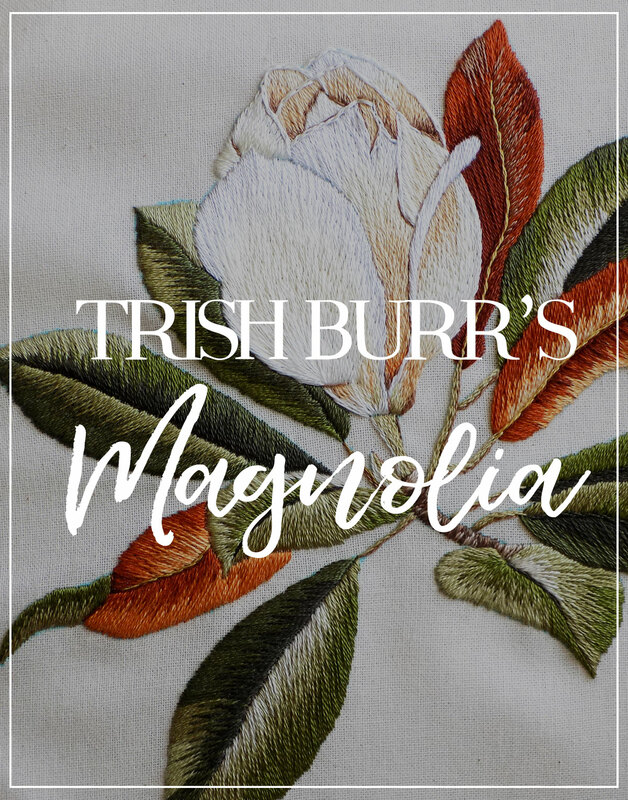 I do love applique and using iron on interfacing has always been my favorite method. Plus, every so often, I enjoy to sew a new blouse for myself and a variety of interfacings all do various tasks as you have mentioned. Yet, I am dumbfounded at myself for never using it in my hand embroidery projects. One I am working on now could have been so much better if I had used interfacing. So thank you for sharing a great solution! Have a fantastic day! So far I've been lucky, all my embroidery where I needed a backing fabric can't be washed, like goldwork and beadwork (you only need to spray the back of the beaded pieces). So I never had to worry about pre-washing anything. I've used fusible interfacing as a backing and I really like this method. Not traditional but very efficient.